← Bayecid complex in Edirne. Edirne, Door Thrace, we offer a monumental historical center a few 225 Km Istanbul. Although we only go one day Edirne, you can visit a lot of places because of the closeness between them. A must-see is the famous Mosque of the Three Balconies, famous for its four minarets are different and the highest of them names the monument because it has three balconies, something unusual in the fifteenth century. After visiting the pride Selimiye Mosque and taste the famous liver prepared in the style of Edirne, should not hesitate to turn to know the Mosque of the Three Balconies. Near the Tower of Macedonia and bustling street Saraçlar, find one of the most famous monuments of Edirne Smart UC Serefeli Camii. It was built between 1437 and 1447, immediately before the conquest of Constantinople which involved the transfer of the capital of the empire from Edirne to the metropolis. Students of architecture certainly know the peculiarities of this building, a transitional work between the Seljuk and Ottoman mosques. Immediately striking because the four minarets are different, both decor and height. 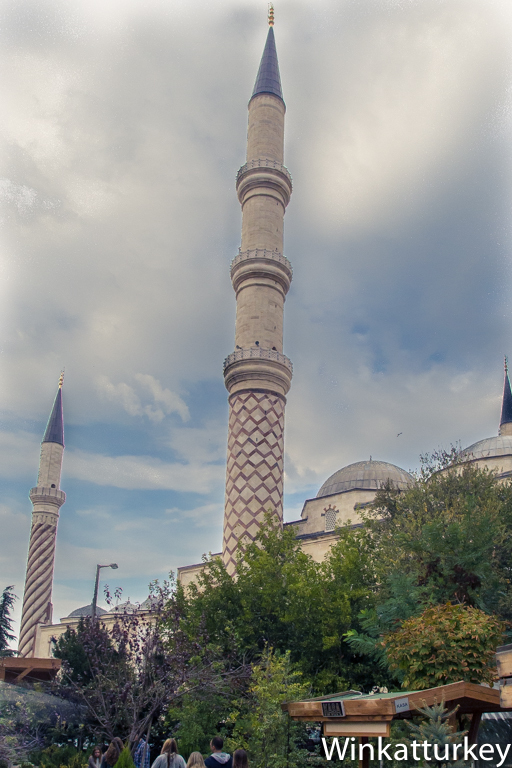 The name given to the mosque was, with its 67 meters, the highest in the world for years until it was surpassed by the minarets of the Selimiye Mosque. It has three balconies and is decorated with a zigzag pattern in red and white, as a curiosity, inside has three stairs, one for each balcony access and is one of the first to incorporate this new minarets. The following spiral minaret is decorated with two balconies. The other two only have a balcony, one is decorated with paintings and the other with vertical lines. Apart from the curiosity of minarets, Mosque highlighted by a beautiful courtyard in the interior decoration of colorful domes set a trend in Turkish mosques in the following centuries. Of course, is one of the nicest I've seen and the recent restoration allows us to enjoy in all its glory. Inside the mosque draws our attention to the great dome, unusual in the mosques of his time who used to have a set of small domes. In fact, its 24 meters in diameter make it larger than many domes imperial mosques in Istanbul. Newly, good state in which the monument is, can admire the colorful decoration of the dome, columns, etc.. When we leave the mosque, have to contain the craving to run to the nearby bazaar built by Mimar Sinan and stop to look back and see the famous gateway. So now we can throw ourselves by our memories of Edirne, soaps known as colorful fruits and brooms good luck.